Oak firewood is one of the best burning types of firewood. 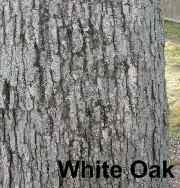 There are many different species of oak, but for the purpose of firewood they are all similar. Oak trees are usually best identified by the presence of acorns. Most species can grow to over 80' tall and have a rounded form when mature. 7-11 lobes depending on the species. 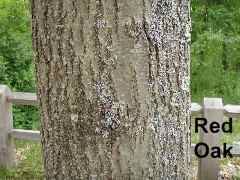 The bark can vary with species, but below you will see a couple of pictures of the most common species(red and white oak). The wood of most species is dark colored. Oak is among the best types of firewood in terms of heating value. It burns long and hot and is generally thought of as one of the best firewood species. Unfortunately, oak is also a difficult wood to split. The grain of the wood is not always straight, which can make for some difficulty when splitting. It's certainly not the worst splitting firewood out there, but it's no day at the beach. I highly recommend burning oak firewood if it is available. Although it can be difficult to split, it's worth the effort because of its high heating value. Just remember that splitting it will take some effort and you'll be fine.